The new MetService app is now available in the app store, free, for iPhone and Android phones. 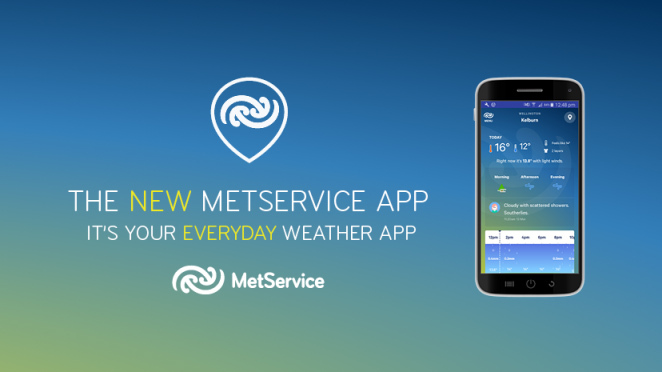 In this blog we answer some commonly-asked questions about the new MetService App. If your question is not answered below, please visit the NEW MetService Weather App 2017 category in our Ask MetService community, where you can find answers to other people's questions or ask your own. You can find information about the new features and how to make the most of your app here. I already have the MetService app. Do I need to download the new one or will it automatically update? The app will be available as an update to the existing app. If your update settings are set to manual, you will need to go into the app store, check updates, and update to receive the new app. If your phone has one of the few older operating systems that is not supported, (below Android version 4.4 and iOS version 9), an update will unfortunately not be available for you. You will be able to access the old app for a limited time and, following that, we recommend using the mobile website m.metservice.com for local and severe weather information. I have only recently paid for the previous app - can I get a refund? All app holders who purchased the app from 1 January 2017 are entitled to a refund - or instead you can opt to have your app purchase amount donated to Surf Lifesaving New Zealand, who do a fantastic job keeping people safe on New Zealand's beaches. MetService will donate funds received from all app purchases from 1 January 2017 to Surf Lifesaving New Zealand, unless you contact us before 16 May 2017 to have the amount paid to your bank account. If we do not hear from you by that date, your app purchase amount will be donated to support the fantastic work of Surf Life Saving New Zealand. If you do want a refund to your bank account, please email apprefund@metservice.com before 16 May 2017 with proof of purchase including the date the app was purchased and your bank account details for the deposit. Why is there advertising in the app? MetService needed to undertake major updates with the app to bring it in line with current technology and design after five years in the market. We also realised the previous charge of $2.99 (iPhone) and $2.69 (Android) was proving to be a barrier for many people. Including advertising on the app allows MetService to make it available at no cost to the user. Removing the cost barrier means more people can access reliable weather forecasts and severe weather information in app form, from a reputable source - New Zealand's national weather authority. It's our mission to make sure every New Zealander and visitor to our country can access important weather information when they need it. Advertising now helps to cover costs for ongoing development and enhancements. Can I keep my old app so that I don’t get the ads? If you have backed up your phone before the app automatically updates, or if you have chosen to manually update your apps, the old app will still be available. However, as with many other apps, the old version will be decommissioned to ensure our efforts can be focused on maintaining and updating the new app. I don’t want ads – can I turn them off? We're aware some people feel strongly about advertising and would like to access ad-free weather content. Some people are prepared to pay for this. Unfortunately there isn't an ad-free option at this stage. There are two ads within the app and one full screen ad that may appear upon opening the app, in the first instance, on some days. MetService has policies around what advertising is not shown on our websites and apps. Due to the wide range of people using these channels, we also ensure advertising meets Advertising Standards Authority Codes and we have an approval process in place. You might find we are stricter about this than other websites, as we want people of all ages to be able to use our websites and apps to keep up to date with the weather. The previous MetService app was available for five years at a one-off cost of $2.69 (Android) or $2.99 (iPhone). This went a small way towards covering costs and ongoing maintenance, but could not support ad-free weather forever. Including advertising on the app allows MetService to remove the cost barrier so more people can access reliable weather information for New Zealand in app form, from a reputable source. Why can't I find the app in store/why won't this app work on my phone? The new MetService app is supported on Android 4.4 and above and iOS version 9 and above. If your phone's operating system is older than that, unfortunately the app won't be available in the app store for you. If you already have the old app on your phone, you will be able to use it for a limited time. Following that, we recommend you use the mobile website m.metservice.com. Note that the app needs the following permissions to work on Android: internet; access network state; access location (for location-based forecasts); wake lock (required to keep the widget up to date). MetService also has a free app for Windows phones and tablets, which is a different app to the one mentioned here. I'm on Android and my MetService widget says "problem loading widget". We've updated the widget with severe weather warnings and a new design. Unfortunately some versions of Android won't automatically remove the old widget, so in those cases you will need to remove it manually before the new widget will work. How can I make the most of my new app? There is a list of features outlined on metservice.com here. We recommend you have a quick read to find out all the tips and tricks to get the most from your new app. Are there plans to update your other apps? Yes! This app is the first cab off the rank in a complete digital refresh programme. We’ll keep you posted on when to expect updates to our other apps and websites. The new version of the app is not supported for iPad or Android tablets. If you have a Windows tablet, you can download our Windows app here. I notice there are features on your website that aren’t in the new app. Are you planning to include them? Our new app will have a regular programme of updates and new features; If you don’t see something you’d like, please let us know by submitting your Idea in the Ask MetService community. Where can I find the latest information about the app? We'll be updating our Facebook Page and Ask MetService community with information and user tips going forward.